The Northern Ireland Longitudinal Study, ONS Longitudinal Study (England and Wales), and Scottish Longitudinal Study include a vast range of data relevant to many different types of research question. Their combination of administrative, census and health data across time make them a rich and unique set of resources. Examples of the types of research enabled by these features of the LSs include: The role of subject choices in secondary education on further education studies and labour market outcomes and Population characteristics of stigma, condition disclosure and chronic health conditions. As an exploration of the many ways in which the LSs have been used, CALLS have conducted an analysis of the journal papers produced by LS researchers. This citation analysis demonstrates the impressive range of academic fields to which LS-based research has contributed in the last 6 years. 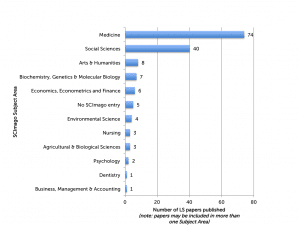 Research featured in almost 60 journals, and spanned more than 40 Scopus subject categories. Research based on the LSs is regularly published in top quality international peer reviewed journals such as Demography, the International Journal of Epidemiology and Population, Space and Place. Fifteen papers in the citation analysis were published in journals ranked within the top 5 for their field (articles ranked by SJR Impact Rating for the relevant subject category in the publication year). Papers had excellent citation rates indicating the acknowledgement of the unique contributions LS data offer. 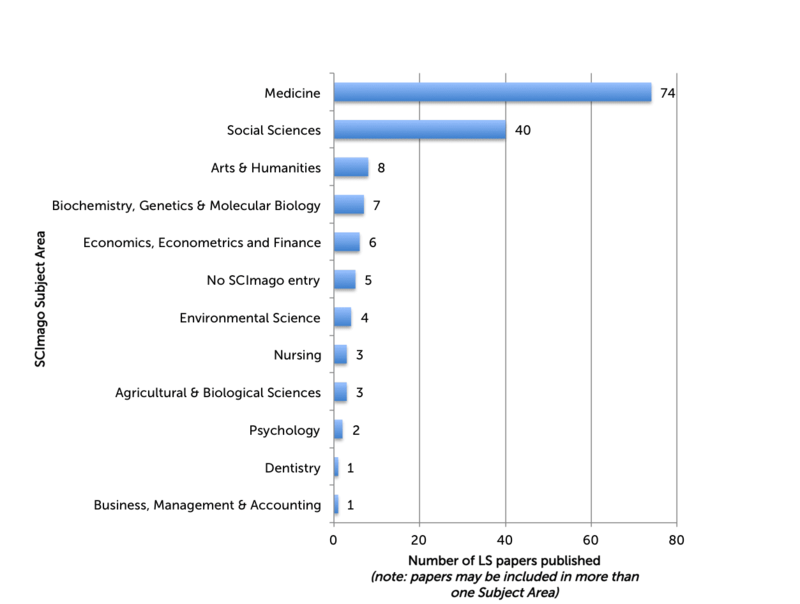 Papers published within the last 2-3 years were amongst the most highly cited. Eighteen papers had been cited 10 or more times. The subject areas of papers using the LSs reflect the strengths of the data that they offer: SLS and NILS had a higher proportion of health-related papers, likely due to their excellent linkages with health data. Looking at subject categories for the LSs also reflect these variations: whilst the categories were very similar, ONS LS’s top 5 included ‘Demography’, whereas the SLS and NILS included ‘Health(social science)’. Although we only focus on publications in academic journals here, LS research has considerable impact in other formats such as briefing notes, books and presentations to government, and has also formed part of a variety of PhD Theses. The full list of outputs can be explored in our Outputs database. Using the CALLS Hub outputs database a total of 106 published papers from the period January 2010 – May 2016 were identified from the three LSs. It should be noted that whilst CALLS and the RSUs actively solicit LS users to record all outputs, and also conducts literature searches to maximise capture, it is possible that some further papers exist. All papers published in journals or regularly produced official publications – such as ONS Population Trends – were included. We did not include working papers in this analysis. Citation counts were gathered from Scopus, taking the final counts as of 30 June 2016. Impact Factors were taken from the Scopus project SCImago using the SJR2 indicator. 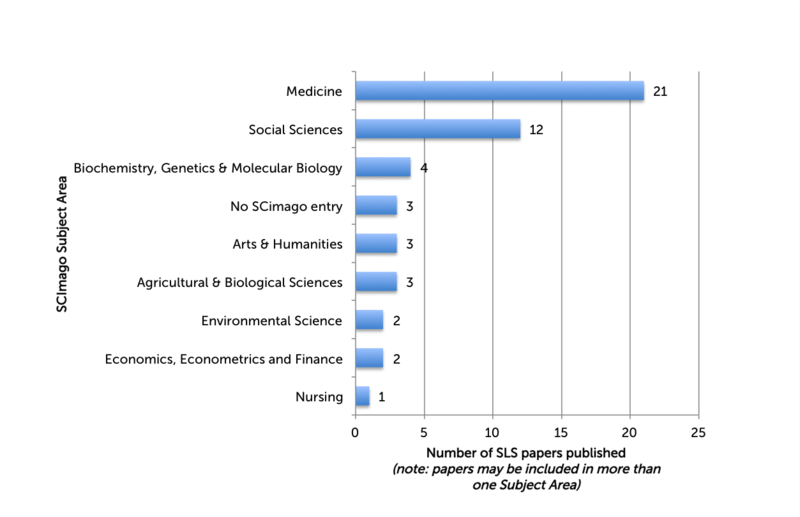 Papers from the three LSs were published in a total of 59 different journals, spanning 41 SCImago Subject Categories in 11 Subject Areas (figure 2). SJR Impact Factors for the papers ranged from 0.128 to 9.893, with an average of 1.577. 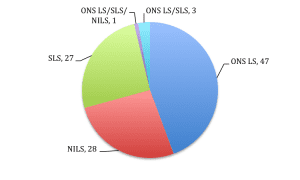 During the period January 2010 to May 2016, a total of 29 journal papers were found which had used NILS data, including one paper which had used all 3 LSs. Five NILS publications appeared journals with top-5 ranked impact factor. 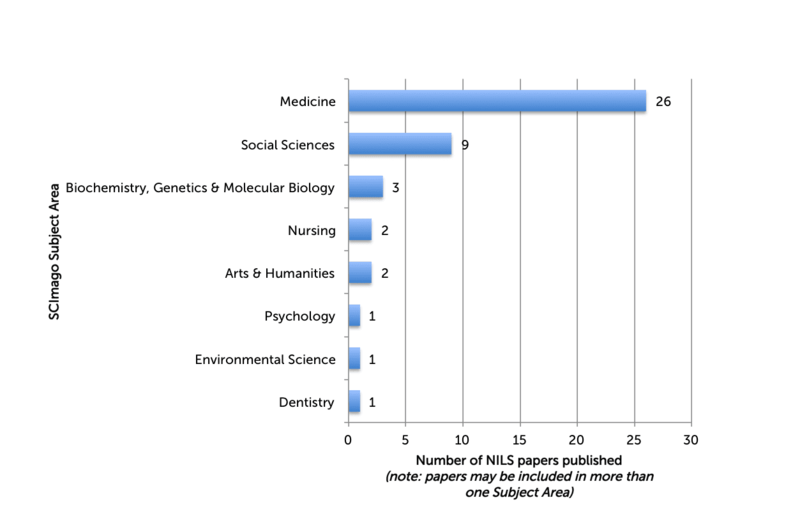 NILS journal papers were published in 18 different journals, spanning 8 SCImago Subject Areas and 22 Subject Categories (see below). SJR Impact Factors for the papers ranged from 0.219 to 4.381, with an average of 1.632. 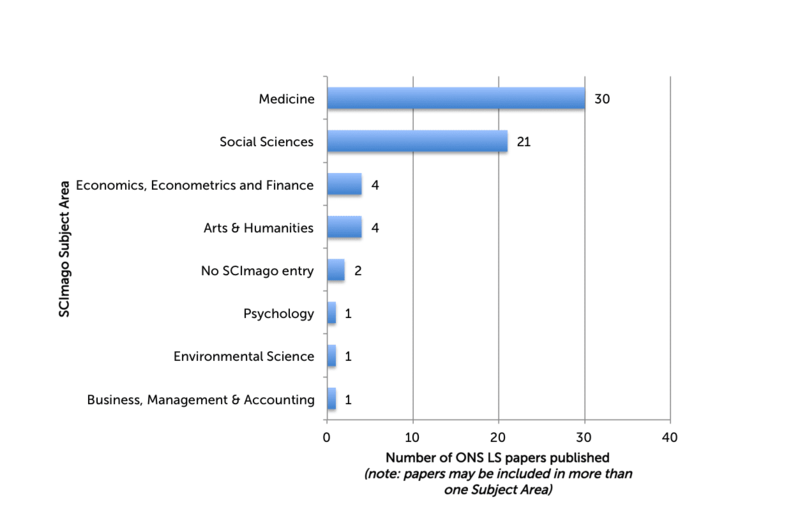 During the period in question, 51 journal papers were identified as having been produced from ONS LS projects (including 4 papers which also used other LSs). Of these, 14 appeared in non peer-reviewed journals. Seven papers appeared in top-5 ranked journals. 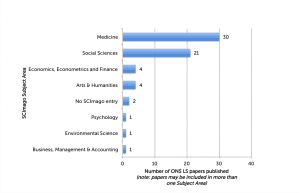 ONS LS papers appeared in 33 journals, and covered 20 SCImago Subject Categories in 7 Subject Areas. SJR Impact Factors for ONS LS papers ranged from 0.128 to 9.893 with an average of 1.453. During the period January 2010 – May 2016, 32 SLS-based journal papers were identified (including 4 papers which also used other LSs). Of these, 2 appeared in non peer-reviewed journals. Three papers were published in top-5 ranked journals. 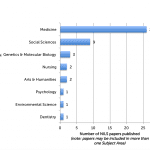 The SLS papers were published in 26 different journals, spanning 23 SCImago Subject Categories in 8 Subject Areas. 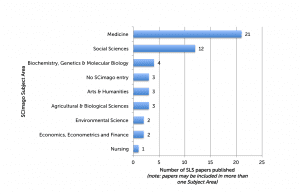 Impact Factors for the papers ranged from 0.226 to 5.667, with an average of 1.6.